In general, modern Breitling is known for their aggressively designed and oversized aviation-inspired chronograph watches. That’s what they do best and that’s what their clients have come to expect from this famous Swiss watch brand. However, for those who want a more elegant approach to a men’s sports watch, Breitling offers the TransOcean collection. First launched in 1958, the TransOcean was Breitling’s creation for the international traveler rather than the military pilots they already served. Today, Breitling draws design inspiration from vintage TransOcean watches to shape the contemporary iterations, but naturally, blends those touches with up-to-date details to suit modern expectations. 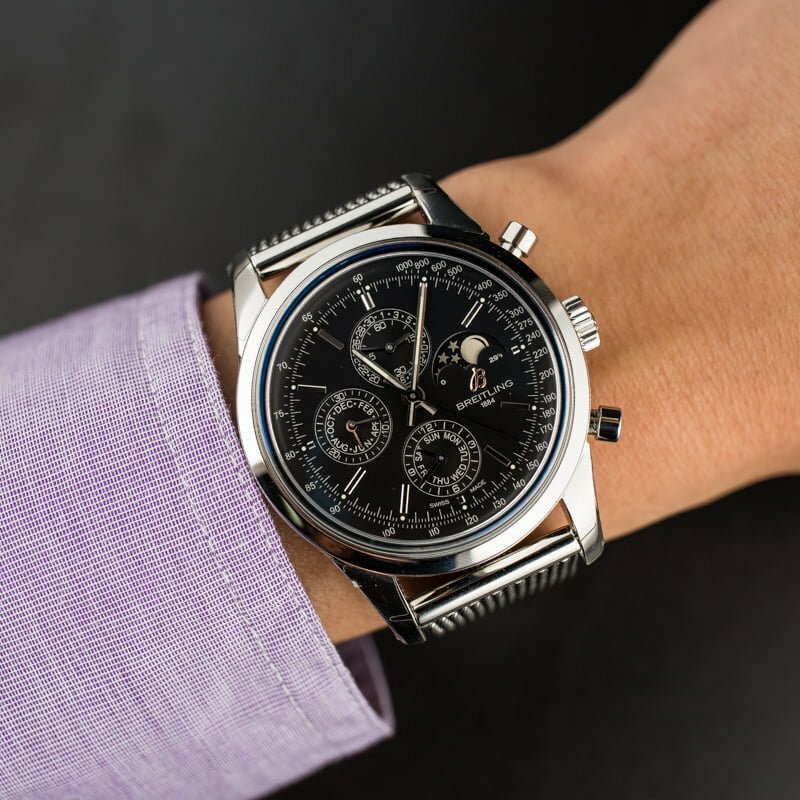 The Breitling TransOcean Chronograph 1461 is a great example of this philosophy—let’s find out more. What are your thoughts on this throw back Breitling? 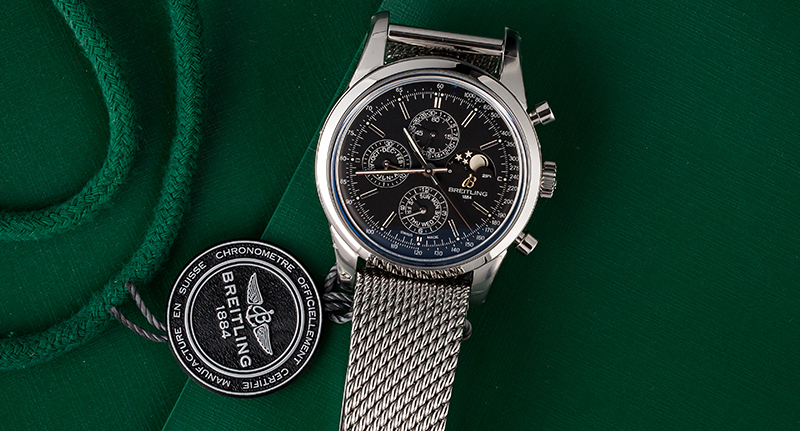 The Breitling TransOcean Chronograph 1461 ref. A1931012/BB68 sports a 43mm stainless steel case fitted with retro style chronograph pushers flanking the winding crown. The smooth domed bezel keeps things classically styled, as does the curved sapphire crystal protecting the face of the watch. There is a lot of information to read off the matte black dial of the Breitling TransOcean Chronograph 1461, however, it’s balanced and legible thanks to the white marking and generous lume. The addition of the moonphase indicator at 3 o’clock balances the trio of subdials at 6, 9, and 12 o’clock nicely. Plus, the simple straight hands and understated stick indexes are the perfect counterpart to all the numbers and text on the dial. Emphasizing the old-school spirit of this contemporary TransOcean ref. A1931012/BB68 is the steel mesh Aero Classic bracelet equipped with a deployant clasp. The TransOcean Chronograph 1461 wears on the wrist perfectly despite the large size. The Breitling TransOcean Chronograph 1461 offers plenty of functionality: time, chronograph, moonphase, and leap year perpetual calendar. Unlike traditional perpetual calendars that only have to be manually adjusted in 2100, the leap year perpetual calendar of the Breitling TransOcean Chronograph 1461 has to be reset every 1,461 days (hence the name), which translates to every four years. So within every four-year cycle, the TransOcean ref. A1931012/BB68 will automatically adjust to indicate the correct time, day, date, and moon phase. The Breitling Chronograph 1461 runs on the Breitling Caliber 19 automatic winding movement. Based on an ETA ébauche, Caliber 19 has the addition of the leap year perpetual calendar module and offers 42 hours of power reserve. A fantastic watch that offers both an attractive design and a host of practical functions, the Breitling TransOcean Chronograph 1461 would make a solid addition to any watch collection.